One of the thing that I found fascinating about Mcdaldno’s work is his drive to take chances, to push the envelop on what a shared narrative experience is all about. The games he has designed (of which I only got two this time around) all have clever new ways to look at things and what it means to tell stories together. Ribbon Drive rulebook: a slim, understated volume. 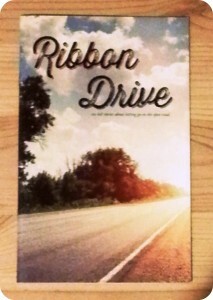 The first of the two games I received is Ribbon Drive, an RPG about going on a road trip, a journey of self-discovery and all this with the help of one or several mix-tapes. This last part is what really got me interested: the music isn’t just helping set the mood, but rather the music is an integral part of the game, guiding the characters’, and players’, journey into the game. The rulebook is a gorgeous little booklet of 32 pages, with full color photographs adorning every page. Really looking forward to trying this and perhaps more intrigued by the idea of preparing for a session by creating a playlist and seeing what everyone else has brought to the table. 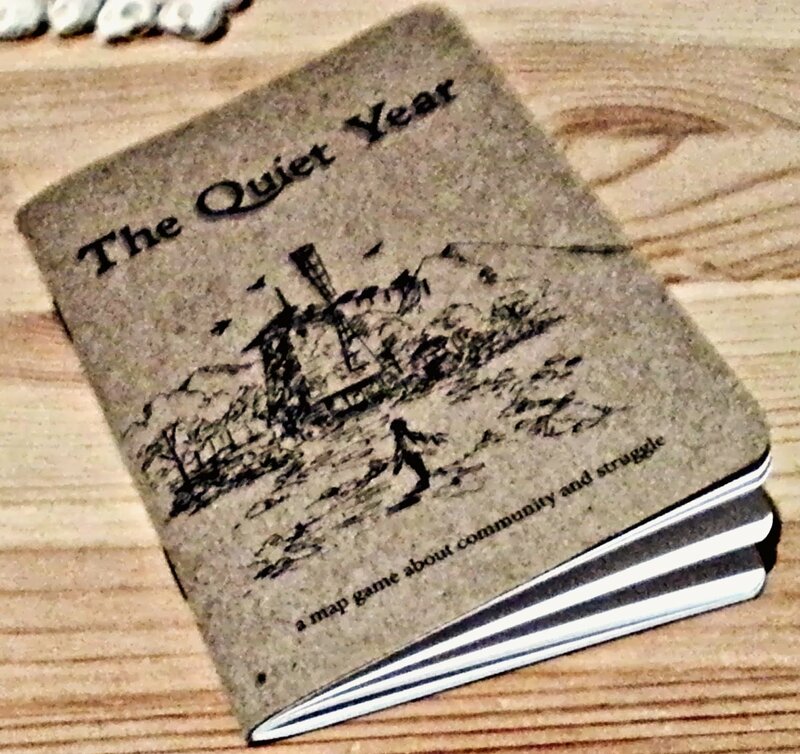 The Quiet Year – the package is inventive and striking. Sets the mood even before you open it up. 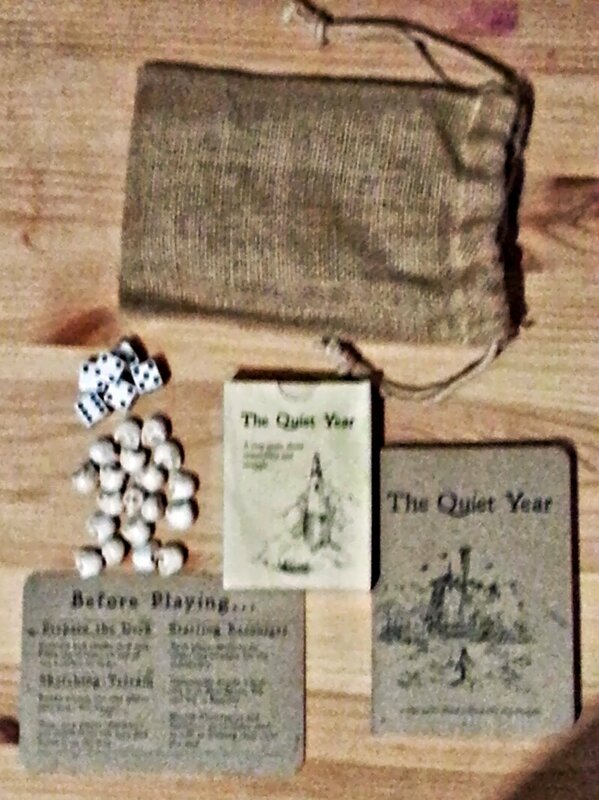 The second game I got is The Quiet Year, or more specifically the deluxe limited edition. As much as Ribbon Drive was interesting in its mechanic, it’s the core of the concept that is challenging in The Quiet Year. You see, this is a cartographic RPG, where the players get together to draw the map of a small village and its surrounding, and decide how the inhabitants react to the events that are taking place over the course of a single year. Since there are no individual characters, this is a true game of collaborative storytelling because any player can add a new feature to the map and add to the lore. 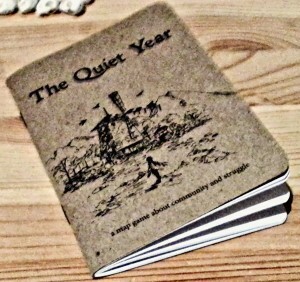 The Quiet Year – this deluxe edition really goes above and beyond. The materials are really first rate. 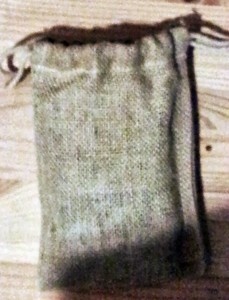 The deluxe edition is really something to behold, packaged as it is in a small, coarse bag. 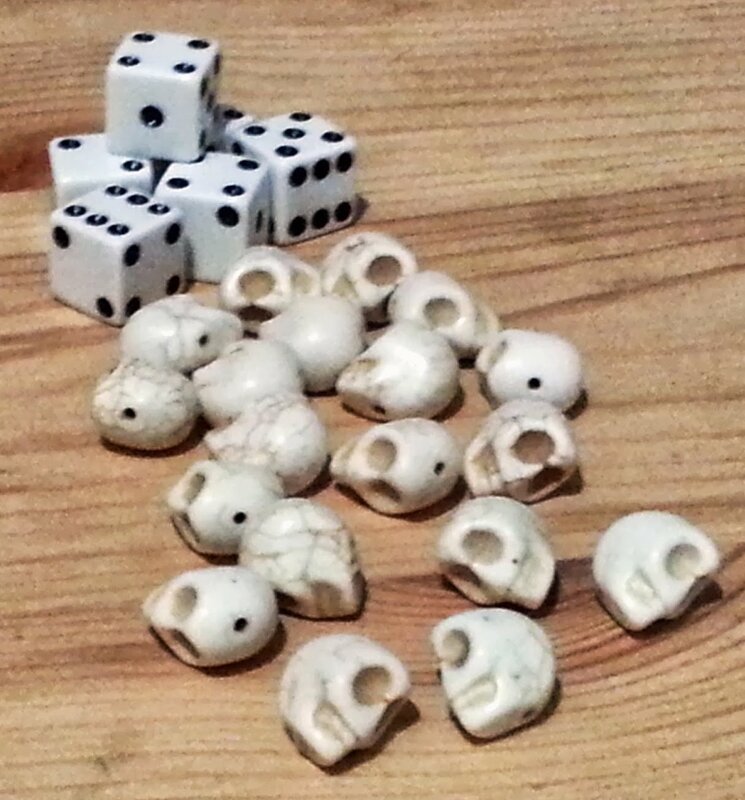 It comes with a deck of 52 cards (more on this later), a small rulebook, dice and 20 contempt tokens. 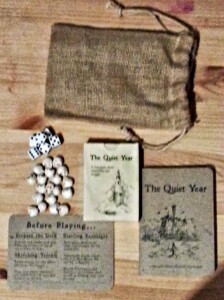 The Quiet Year – just regular dice, but those contempt tokens really add to the mood. 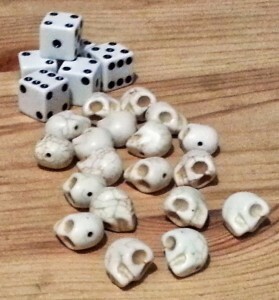 The tokens could have been just regular token, but Mcdaldno went above and beyond by furnishing these small skull token. Now, I know that they’re probably just baubles that are meant to be strung on a bracelet or something, but they do add a certain amount of moodiness to the whole game. The rulebook is again a small booklet, with just enough information to get the players playing. 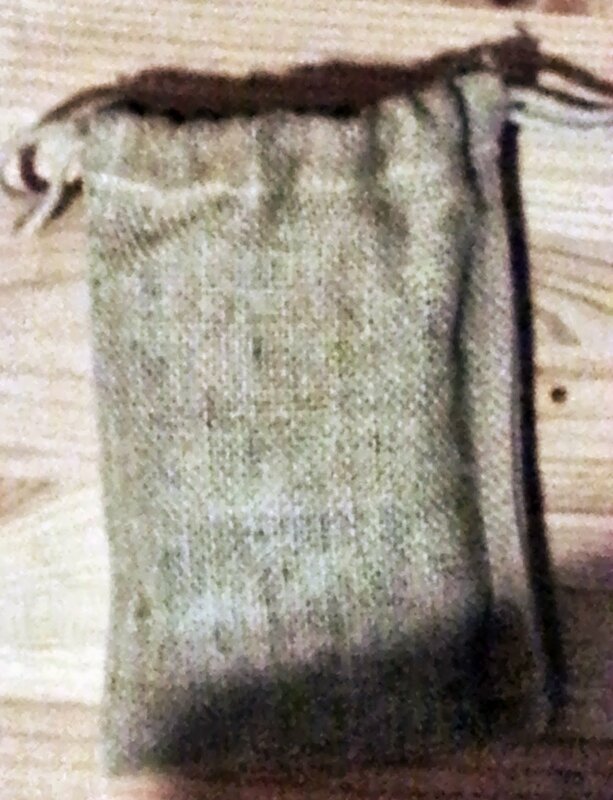 Again, the care taken with the physical object is to be commended, as it highly reminds me of a personal journal, akin to a small Moleskin booklet. 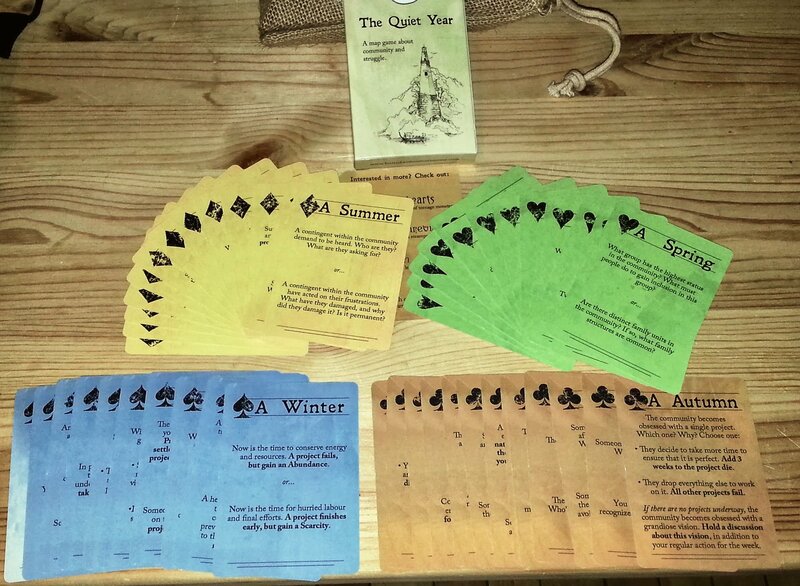 The Quiet Year – the deck of 52 cards or events. The deck of 52 cards is the heart of the game, being broken up into four seasons. These cards, each of which represent a week of time, are what drive the events of the game forward, with each card being drawn randomly and giving a player a specific challenge or event. Very cool stuff and can’t wait to try it out. Looking forward to more inventive games from Joe Mcdaldno.